The Thuya (Araar) is a genus of evergreen coniferous tree in the cypress family Cupressaceae, containing only one species, Tetraclinis articulata, also known as Sandarac or the Barbary thuja, endemic to the western Mediterranean region. It's native to northwestern Africa. is regulated because of its scarcity. This resinous species is widespread because it can colonise any substrata. It is also necessary to note that Thuja ecosystems are quickly restored after disturbances because of the species high resilience (Benabid, 2000). if well managed as a coppice forest. This type of forests is generally managed as coppice. The plant has an important social and economic value. 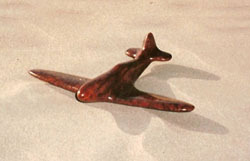 Its wood is much appreciated for local crafts. The hard wood of the aromatic species of Thuja is used by the artisanal and local handicraft industry. For this reason the species faces high anthropic pressure. 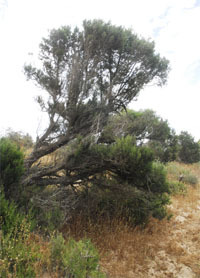 In the study areas where the climate becomes more arid with increasing distance to the continent, the Thuja is replaced by Juniper (Juniperus phoenicea). As a consequence of the efforts that have been undertaken for the stabilisation of the dunes,regular plantations of Eucalyptus gomphocephala and Acacia species are widespread in the coastal zone.